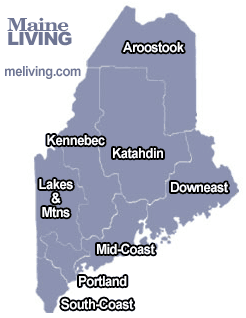 Midcoast Maine is an ideal place for your outdoor adventure. Midcoast Maine is a popular destination for hikers who want the best of both worlds – mountains and beach. Camden Hills State Park is one of the more popular destinations since there are many mountains to hike and have views of the Atlantic Ocean. Make sure to visit Elephant Mountain to see the B-52 bomber memorial. Please share your Maine hiking comments. To feature your business, contact us. Camden Hills State Park’s signature location is the scenic vista high atop Mount Battie, where sweeping views of Camden, Penobscot Bay, and surrounding islands await. On a clear day, visitors can see Cadillac Mountain at Acadia National Park. Mount Megunticook, the highest of the Camden Hills – and highest peak on the mainland – is a moderate climb by foot trail. Skiing and snowmobiling trails also exist in the park. 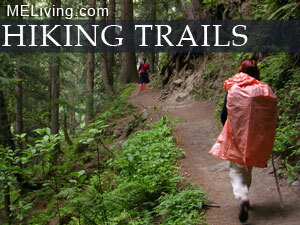 This is an easy hike through a mixed forest. Elephant Mountain stands within the watershed of the Piscataquis River, which drains into the Penobscot River, and into Penobscot Bay. The west side of Elephant Mountain drains into North Brook, thence into Upper Wilson Pond, Lower Wilson Pond, Big Wilson Stream, Sebec Lake, the Sebec River, and the Piscataquis River. The south and southeast faces drain into South Brook, thence into Upper Wilson Pond. The northeast face drains into Baker Brook, thence into Mountain Pond, Mountain Pond Brook, the West Branch of the Pleasant River, and into the Piscataquis River. On January 24, 1963, a United States Air Force B-52 plane crashed on the mountain. There are pieces of the wreckage still on the mountain with a memorial, where hikers can visit. The beginning of the trail is rough and wet, but conditions do improve after the bomber. Elevation gain is 600 ft.
Moose Point is a stunning park with a beach area where tidal pools form at low tide and a set of stairs that brings visitors straight to the surf at high tide. This coastal park is filled with opportunities for leisurely hikes or peaceful walks along the water’s edge. On muggy summer days, a stroll through cool, piney woods is a welcome respite.